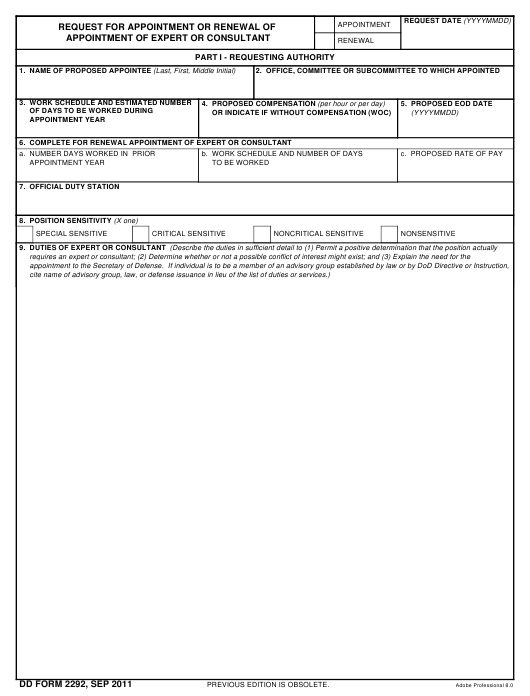 DD Form 2292 - also known as the "Request For Appointment Or Renewal Of Appointment Of Expert Or Consultant" - is a United States Military form issued by the Department of Defense. The form - often incorrectly referred to as the DA form 2292 - was last revised on September 1, 2011. Download an up-to-date fillable PDF version of the DD 2292 below or request a copy through the chain of command. h. Required documentation is in order and a favorable security/suitability determination has been rendered. considered the requirements of law (5 U.S.C. 3109) relevant Comptroller General decisions and 5 CFR Chapter 304. Appointment and Renewal blocks: X appropriate box. Request Date: Date that form is filled out. Block 1: Name of Proposed Appointee. Use legal names to include middle initial and suffix, as appropriate. Environmental Research and Development Program)). the service year. Must be completed for a NEW appointment. is NO compensation enter WOC. Must be completed for a NEW appointment. Block 5: Proposed EOD (Enter on Duty) Date. Date requesting Expert/Consultant to start work. Service Year for Expert/Consultant". Must be completed if this is a RENEWAL of appointment. Expert/Consultant will work during the service year. Must be completed if this is a RENEWAL of appointment. NO compensation enter WOC. Must be completed for a RENEWAL of appointment. Block 7: Official Duty Station. Enter the name and address of the facility where the Expert/Consultant will be working. Block 8: Position Sensitivity. X the appropriate box. that authorizes the committee. If the advisory committee is discretionary, cite the date the committee's charter was filed. Block 10: Describe Nominee's Background and Experience as it Relates to the Requirements of this Appointment. Explain why the Expert/Consultant fits requesting position. Attach a copy of the person's recent resume. Block 11.i: Signature of Authorizing Official. Must be signed by USD or designee. Block 11.j: Title of Authorizing Official. Title of person signing.